At Trevecca, we believe music is an essential part of the liberal arts education. Our goal is to provide an outstanding ensemble experience for all Trevecca students. Choral and instrumental ensembles within the School of Music & Worship Arts are open to all students regardless of major. Ensembles provide both music and non-music majors an opportunity for continued musical training, arts education, fellowship and spiritual growth. For our music majors, we view the ensemble component of your degree as the practical daily application of both their private applied study and their core degree music classes including written music theory, aural music theory and music history. As a member of one of our ensembles, you will learn from expert faculty and take part in performances both on and off campus. Our ensembles tour regularly both within the Southeast Educational Zone of the Church of the Nazarene and abroad. A complete listing and information on all of our ensembles and their directors is available via the navigation menu. If you have questions or would like more information on getting connected with an ensemble, please contact the ensemble's director. If you’re interested in making music at Trevecca, we have a place for you! Who Sings in choirs at Trevecca? Choral singing has a rich tradition at Trevecca Nazarene University. We seek to honor the Lord by continually raising the standard of excellence in choral singing so clearly inherent throughout the history of the university. We strive to provide outstanding choral ensemble experiences for all Trevecca students, preparing them for a lifetime of contributing to the church and greater choral world community. Each of our choral ensembles offers singers an opportunity for the refinement of their vocal and musicianship skills in a collaborative environment of fellow believers. At Trevecca you will sing choral music of all styles and varieties, including great choral-orchestral masterworks, and tour the world. Trevecca’s choral program also supports the activities of future church musicians, choir directors, and choral music educators by sponsoring a student chapter of the American Choral Directors Association. To learn more about the choirs we offer, contact Dr. Thomas Lerew at TELerew@trevecca.edu or call 615-248-1571. Singing in choir allows students to contribute to something greater than their individual selves. It allows them to form new friendships and worship the Lord through music. Regardless of past experience or musical ability, we have a choir for you! We know that the thought of singing alone for professors may seem a bit daunting. But, we encourage you to think of the hearing more as an opportunity for experienced faculty to guide you in selecting the choral ensemble that best fits your interests and skill sets. Remember, we have a choir for every student. We WANT you to sing with us! Choral placement hearings for Trevecca choral ensembles are held at the beginning and end of each year. Current students will be heard at the end of the spring semester (during finals week) for the following school year. Hearings for new students, students that have never sung in a Trevecca choir before, or students that were studying off-campus during the previous spring semester are held at the very beginning of the fall semester. All choral placement hearings are held in the Jackson Center for Music and Worship Arts (Room 209) and last about eight minutes. No preparation is necessary! The hearing consists of vocalization (listening to your tone and determining your vocal range), tonal memory exercises, and a brief sight-singing passage (don’t worry, just do your best). You may bring a prepared piece from your voice lessons to perform or simply sing the first verse of “Amazing Grace” – either option is fine! There will also be time to answer any questions you may have about the different choirs we offer. We will be happy to schedule hearing appointments for those students interested in joining a choir mid-year on a case-by-case basis. Questions? Want more information? Email Dr. Thomas Lerew at TELerew@trevecca.edu or call (615) 248-1571. Mon/Wed/Fri 12-12:50 p.m. & Tues/Thurs 12:10-1 p.m. Established in the fall of 2016, the TNU Singers is the premier traditional choral ensemble at Trevecca Nazarene University. Membership is composed of the university’s most skilled singers across all academic areas of the university, not just music. The ensemble strives for the highest levels of choral artistic excellence and performs a variety of repertoire from mass settings of the Renaissance era, to choral-orchestral masterworks, to contemporary compositions of today. In addition to performing on-campus concerts throughout the year, the TNU Singers showcase Trevecca’s choral program by singing at local schools and churches, and by touring throughout the southeast United States. The TNU Singers are conducted by Dr. Thomas Lerew. For more information about University Singers, please e-mail the director at TELerew@trevecca.edu or call (615) 248-1571. The Concert Choir offers a singing experience to students, staff, and community members from every area of Trevecca life. This entry-level ensemble is non-auditioned and seeks to instill the necessary musicianship skills of aural and notational music literacy, ensembleship and vocal development necessary to audition into higher levels of the Trevecca choral music program. The repertoire consists of music from various historical eras of the Western canon as well as traditional and contemporary repertoire throughout the world. songs, to hymns, to spirituals, Concert Choir pursues sensitivity in their musicianship and excellence in performance. For more information about Concert Choir, please e-mail the director, Dr. Thomas Lerew, at telerew@trevecca.edu or call (615) 248-1571. The Commercial Vocal Ensemble performs standard jazz, Pop, contemporary Christian, and much more. The ensemble performs a cappella, with piano accompaniment, and with occasional instrumental support. Auditions are held in late April and August. Students admitted are expected to commit to a full year. Commercial Vocal Ensemble is open to all students regardless of major. For more information about Commercial Vocal Ensemble, please e-mail Prof. Caroline Henneberry at cahenneberry@trevecca.edu or call (615) 248-1288. Tues/Thurs 3 p.m. - 4 p.m.
There’s nothing like the sound and experience of a dynamic choir lifting their voices in song! Testify, Trevecca University’s premier Gospel Choir, is known for its passionate and high-energy performances and its diverse repertoire. Their transcendent take on everything from traditional Gospel to contemporary Worship has made them a go-to source for live and studio performances with Zach Williams, Casting Crowns, Mandisa, NewSong at Winterjam, and more. Under the leadership of Director Mark Hosny, Testify frequently performs around Nashville and on tour. No audition is required, but interested singers should have a passion for worship and a desire to lift their voice to the Lord! Founded in 1959, the American Choral Directors Association (ACDA) is a nonprofit music-education organization whose central purpose is to promote excellence in choral music through performance, composition, publication, research, and teaching. In addition, ACDA strives through arts advocacy to elevate choral music's position in American society. The student chapter of the American Choral Directors Association (ACDA) at Trevecca exists to support the goals of the nationwide ACDA, to equip TNU choral students with the tools necessary to succeed in the worlds of professional and educational choral music and to support the efforts of choral ensembles within the School of Music & Worship Arts. Membership in ACDA will benefit any student who may one day be in the position of directing a choir. This includes music education students, vocal performance students, commercial music students, future worship leaders, and music composition students. TNU-ACDA will help you by providing practical experiences and a deeper understanding of the choral field. Nationally, ACDA membership consists of choral directors who represent more than one million singers across the United States. ACDA members teach choral music in public and private schools — kindergarten through senior high school — and at the college and university levels. They conduct a variety of choral groups, including boy choirs, children's choirs, men's and women's choruses, junior and senior high school choirs, college and university choruses, ethnic choirs, vocal jazz ensembles, and symphony choruses. They also conduct choirs in their communities and in the church. In order to experience the full benefits of being a member, the student chapter encourages everyone to become a member of ACDA. Student membership costs only $35 per year. We provide a chapter lecture series that brings experienced vocal music professionals to campus to share their knowledge and techniques. We create opportunities to go off-campus to observe rehearsals or view performances of the highest caliber. We maintain a fundraising program that provides assistance to chapter members attending ACDA conferences. In an attempt to increase the excellence of everyone’s college choral experience, we work to recruit students for Trevecca’s choral ensembles. The student chapter is planning to send a delegation to the Southern Division ACDA Conference in Louisville, KY from February 21-24, 2018. 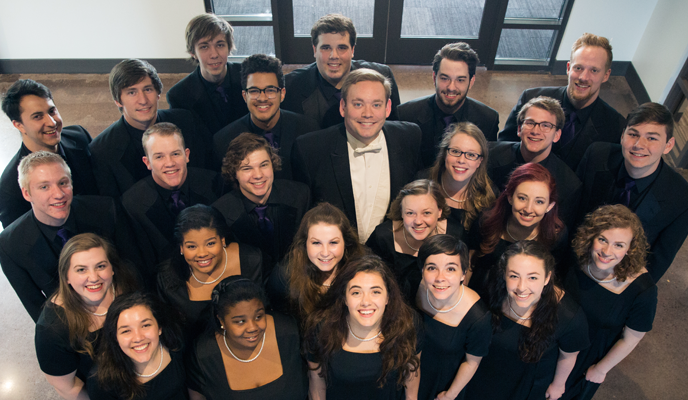 Choirs at Trevecca rely on the help of our Friends of Choral Music throughout the year. In addition to collaborating with us to set up concerts, we seek your assistance in meeting the financial needs of the choral program. The Friends of Choral Music fund exists to support the activities of the choral program that go beyond our normal operational budget. Most importantly, this fund seeks to allow students, for whom it would not be financially possible, to participate in our international choir tours. We make every effort to provide a yearly domestic touring experience free of charge to every student, however, travels abroad are often more costly than our students can afford. The generous donations of our supporters facilitate many of our students wishing to participate in overseas tours to do so. If you are interested in helping the choral program and our exceptional students, please contact Dr. Thomas Lerew at TELerew@trevecca.edu or 615-248-1571.